TOKYO — From August 19th to Octover 16th, 2015 — Launching on Indiegogo and MotionGallery, Fountain Ring is Yuki Sugihara’s latest work, which gives you the possibility to enjoy your very own fountain. water dome that could cover the whole body, using the falling water as a suitable screen for projection mapping. She eventually managed to build 11 of them at Japanese museums, department stores and rock festivals as temporary installations. In order to make them as entertaining as possible, she needed great quantities of water, lasers and lights, but that wasn’t always possible. Thus, she soon decided to focus her efforts into creating a small but beautiful fountain instead, spand so the concept behind the Fountain Ring was born. Studying the special shapes needed in order to create different types of water membrane, she individuated five in particular: a butterfly, a spider, a dragonfly, a cherry blossom and an arabesque. Thanks to her achievements she received the Lexus Design Award in 2013. She was finally able to turn two of those design into actual finger rings, creating 3D and wax models at first and silver ones later on. The finishing touches were added by a local craftsman, making Fountain Ring a product 100% made in Japan. 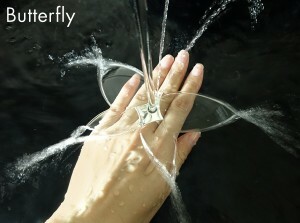 With the butterfly ring, people can enjoy the refined and fluttering shape of a water butterfly by placing the ring directly under running water. Or, by adjusting the water flow, with the spider ring they can experience the elegant and delicate curve of a water spider’s legs. The rings will be available in two different sizes, small and regular, and in five rhodium plated colors: silver, grey, black, gold and rose gold. 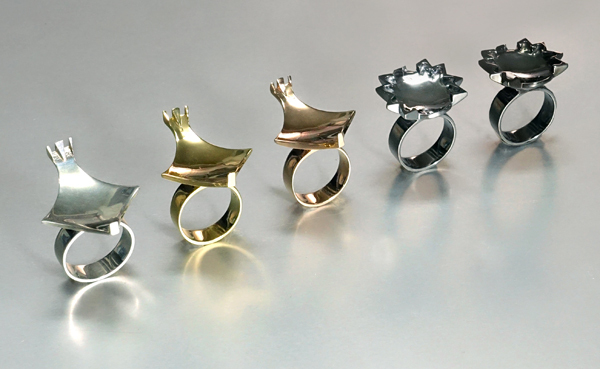 These rings are the product of a lifelong research, and thanks to Indiegogo and Motion Gallery she would like to have the possibility to share her dream and celebrate the importance of water with everyone. These special Fountain Rings can be worn anywhere, anytime. While washing their hands, drawing a bath or playing in the pool, anyone can enjoy their very own fountain. From now on, wherever you go, the world is your stage. Please e-mail info[atmark]aterlier-opa.com to request HQ pictures. Please visit indiegogo.com(coming soon) for more information. Atelier OPA endeavors to create product design, art, interior design, and architecture with an original touch. They like to study good design, art and architecture of all over the world. Besides, they like to show their works abroad. They were awarded with the “if Design Award 2014” in Germany, the “Lexus Design Award 2013” in Italy and the “Asia Design Award” in 2007, 2008 and 2009. 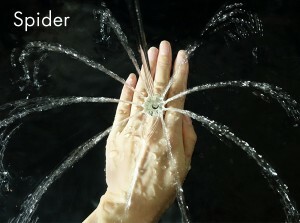 Sugihara is an advocate of the water-friendly fountain where people can come into contact with water membrane with joy. She started her career at Musashino Art University, and earned her PhD at Tokyo University with “A study on Immersive water display.” Her latest work is “Fountain ring.” Her dream is to share the pleasure of water with everyone within the country and beyond. She endeavor to create new product design and art with her own studio, Atelier OPA.